Vapor Trails NW has permanently gone out of business. JuiceDB will retain this page and it's reviews for historical purposes. Come sample the delicious fruits from the hanging gardens of Babylon! This blend features Blueberry and Pear, with a few other fruit notes thrown in to help take this juice to the next level. A fan favorite, and all day vape, M4 is a RY4 (tobacco) blend augmented with extra caramel and vanilla! Mango and watermelon- as simple as that! This blend is high in flavor intensity, and is great for those of us who enjoy a bright and fruity blend. This is a Strawberry-milk blend that we hope can put you in a time machine back to 1992. Delicious cereal flavors with sweet vanilla cream milk. JuiceDB doesn't know what anyone thinks of Vapor Trails NW (Closed). Be the first to review this product! 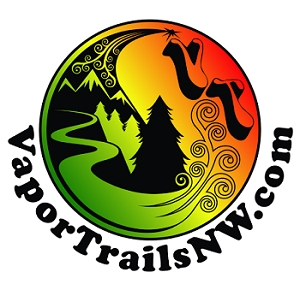 40 reviews for Vapor Trails NW (Closed). Have never had a bad experience with these guys. Quality juice ready to use the same day as receiving, they also show you the day it was made. They are pretty generous with giving away freebies or upping the size of your bottle. The DIY section they have is great as well. Quality juice at a good price and excellent customer service. Matt was super helpful writing me several emails to answer my newbie-vaper questions. Plus, every order so far has either had a bottle upgraded to a bigger one or a free 15ml thrown in. Fast everything! They usually ship my order the day after it's placed. Twice now I've received my juice within three days after placing it. On both orders I received a bonus, the first time it was a free bottle of juice. Second order all four of the 10ml bottles were upgraded to 15ml. When I placed my order I had a question regarding one of the flavors and he answered my question writing me back on my receipt. Kinda cool when an owner of a company hand writes you a note. Give them a shot and see how good pricing plus good products equals an awesome vendor. Had an issue with a flavor that I love after steeping. I contacted Matt and he offered to remake my juice I asked if he could alter the flavor making it more sour and he came through. Shipping took 2 days and the replacement order was totally free. Amazing flavors and even better customer support! Great juices at affordable prices. They always ship fast and include a free bottle with every order. Highly recommended! p.s. Look for discount codes on reddit.